A lovely apartment, beautifully decorated with everything you need. The treat is to wake up every morning to the gorgeous views of the lake. The walking path along the lake leading to the castle and Montreux is right next to the building as well as the bus stop. Very easy to get around. Anne was very helpful and friendly. Would definitely stay here again. 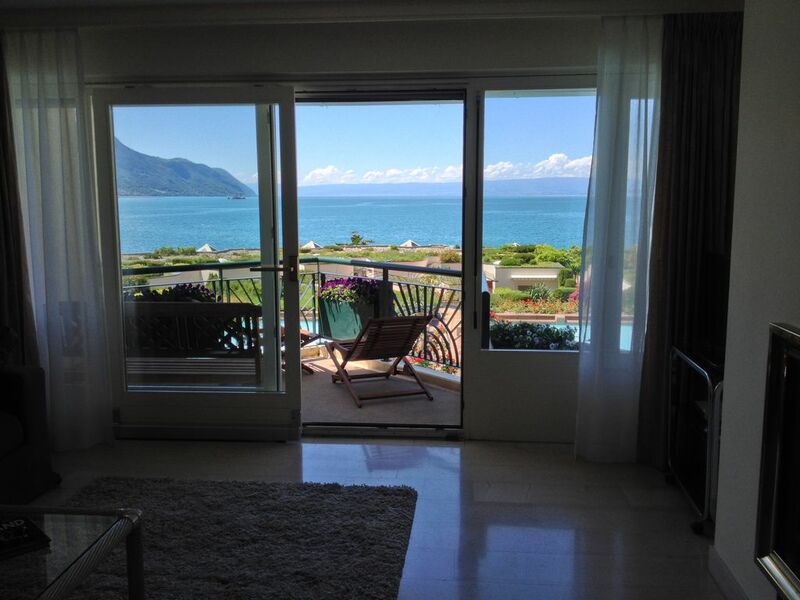 While a few kilometers away from the shops and restaurants of Montreux this is a lovely and well maintained apartment and the host, Anne, is exceedingly helpful and gracious in accommodating your needs. The condo has a gorgeous view of the lake and adjacent mountains and the sight of the Swiss tour boat passing by directly in front of the window every few hours only enhances the experience. The facility is well maintained inside and out and has a lovely garden with decorative pools. Location is within easy walking distance via the adjacent lakeside path to Villeneuve where all amenities can be found. Parking and navigation from the lot to the apartment and around the grounds can be a bit confusing at first but is easily learned. All in all an exceptional place for a honeymoon or any other trip to this region. The property is as beautiful as the picture. It was clean and had everything we needed, including free bikes. Views of Lake Geneva are gorgeous. Unfortunately, the town it is located in pretty much closes down at night. You can remedy this by taking a bus into Montreal using a free pass provided by the owner. Eine wunderschöne Woche, Domizil, Gegend und Wetter super. In der Wohnung von Anne Fankhauser haben wir uns sehr wohl gefühlt. Die Vermieterin ist sehr zuvorkommend, freundlich und hilfsbereit. Die Wohnung ist von der Lage, der Aussicht und der Ausstattung her optimal. What a wonderful place to stay in that location of Switzerland, it is a spacious place that offers, a kitchen, dining room, 2 bathrooms, 2 bedrooms and on site secure parking. What else can you ask for? Air conditioning or fans, we left the bedroom doors open to get a breeze but it was tough at times to get air inside otherwise it would have been 5 stars. the host was kind and helpful. Thank you i look forward to returning. Fabuleux vue sur le lac! Grand appartement avec tout comfort. Beaucoup de privacy, repos total.